Geprge Lucas really got us excited about his whip-wielding archaeologist. 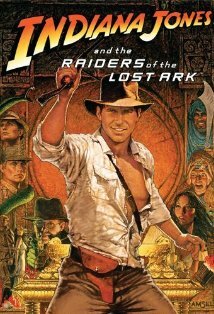 I still remember the first appearance of Indiana Jones. It was a hot summer Saturday morning in Phoenix back in 1981, and I was standing in line with four female friends from Phoenix Public Library at the ChrisTown theaters in northwestern Phoenix. The line went around the building and stretched off across the parking lot, and I was nowhere near the front of it. Expectations were high after Lucas’s success with Star Wars. It was hot, and we were all sweating, and the line seemed to move at a snail’s pace, but we finally got inside, found good seats in a huge dark theater. When the heroic music came up–Daht da da daaah, dut da dahhh–we all knew we were in for the movie experience of a lifteime–hadn’t felt quite like this since the first showing of Star Wars. And I don’t think there has been a movie since then that provided quite the same combination of anticipation and joy in just watching the adventure unfold. Yes, I went and watched the other Indiana Jones movies, and I loved them, but nothing had quite the same effect as that first showing. I came away from that show with something that would change my life. And a few years later in Adventureland in Disneyland after riding the jungle cruise, I finally found a brown fedora–just like Indy’s. And I bought it, and have worn one ever since–in my circles it is now known as the Trollgod’s Hat. I might not have the same exorbitant adventures as Indiana Jones–no lost arks or holy grails or crystal skulls for me, but at least I had the same hat, and over the years it has gone into plenty of adventures around the country (sigh, not around the world) with me. –Daht da da daaah, dut da dahhh!!!!! The book begins with a 3-issue adaptation of the Raiders movie, and then seamlessly moves beyond it for 9 more issues before Dark Horse ran out of pages. 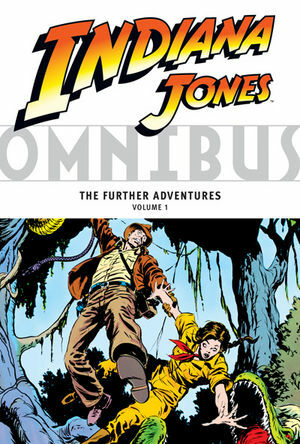 The comic was called THE FURTHER ADVENTURES OF INDIANA JONES and features a picture of Indy cracking the whip on the cover of issue 1. Following the murder of a former student in his own office, our hero is off to Africa to find the golden Ikons of Ikammanen. He finds them, too, but these are not ancient archaeological treasures–more like hideous modern death. And so it goes through 12 more issues in this mighty compilation. Indy doesn’t meet the supernatural in every issue, but he does swing the whip a lot. He dangles or just plain falls from high places a lot, including bailing out of a crashing plane without a parachute, falling into pit traps, and so forth. A strong whip arm and fingers with a steely grip save him time after time. That, and a lot of help from his daring girl friend, Marion Ravenwood, keeps him alive time after time, proving the Trollgod’s favorite saying over and over–it’s better to be lucky than good. You never saw a luckier hero than Professor Henry (that’s his real first name) Jones. Jones meets a new romantic interest every couple of issues like British language expert Karen Mays, but he keeps getting coming back to Marion Ravenwood. The comic writers make it seem like fate. He left her behind once, and Marion seems determined not to let it happen again, even if she has to follow him to the farthest corners of the world, like the Congo. We know from the Kingdom of the Crystal Skull movie that he sired a son with her, but they never married. You have to wonder why. These early comics may have the answer. Marion is an alcoholic–a very pushy, demanding alcoholic. If there is liquor in the room, she is quickly gulping it down. She is brave and tough and cute, but she’s also a walking disaster. Jones is no boozer. He needs a steady hand and eye in his line of work. My guess is that her drinking split them up sooner or later. Heh! It’s strange how we can get so wrapped up in the stories of fictional characters that we have to speculate about their lives, even the parts that aren’t shown in the fiction. These early Indiana Jones comics had some of the best scripters in comics at the time, including John Byrne for the first issue. I enjoyed them, and if you’re an adventure fan, you would too.